At Vanderbilt we believe the greatest successes for imaging in the future will come from environments where the complementary natures of different imaging approaches are exploited, where experts in basic sciences and technical aspects of image formation and analysis collaborate closely with biomedical scientists who ask appropriate questions, and where the basic underlying science of imaging is fostered. *Note: Parking is available across the street from VUIIS in the East Garage at 1210 Medical Center Drive. VUIIS is a trans-institutional initiative within Vanderbilt University serving physicians, scientists, students and corporate affiliates. 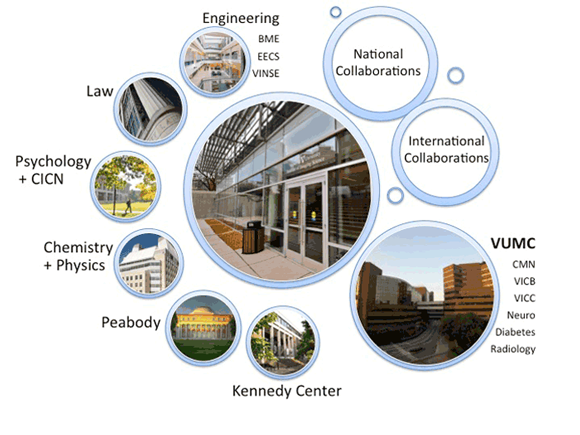 VUIIS maintains close collaborations in research and training with many parts of our campus including the schools of medicine, engineering, arts and science, law and Peabody College. Since the first X-ray images were produced at the end of the 19th century, medical imaging has provided information of vital importance about the inner structure and function of the body for clinicians and scientists. Biomedical imaging techniques have developed in recent years into a compendium of increasingly powerful technologies that are used not only for diagnosing diseases but also for the study of biological structure and function, of metabolism and physiology, and of fundamental molecular and cellular processes. The development in the past two decades of new and more powerful imaging technologies such as MRI and PET, coupled with the explosive growth in the power of digital computers, have dramatically changed the nature of biomedical imaging science. Imaging plays a central role in patient management and care and provides crucial insights into the pathophysiology of many types of disease, such as cancer and neurological disorders. In addition, in vivo imaging methods also have widespread application in the elucidation of biological structure, in the study of basic biological functions and physiological processes, and in drug discovery. For example, the development of functional brain MRI (FMRI), and the study of brain neurochemistry by MR spectroscopy and PET imaging, are recent advances that promise to have a major impact on our understanding of how the brain works. New technological developments and advances in molecular sciences have expanded the applications of imaging to many new areas of medicine, such as the study of the effects of genetic modifications and of gene expression in animals. 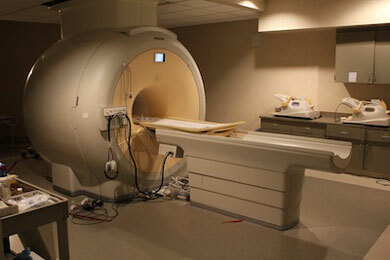 VUIIS operates state-of-the-art facilities for imaging research at all scales including imaging animals and human subjects. We pursue research in developing new imaging methods as well as applications in cancer, neuroscience, metabolic disorders, cardiovascular disease and other areas. 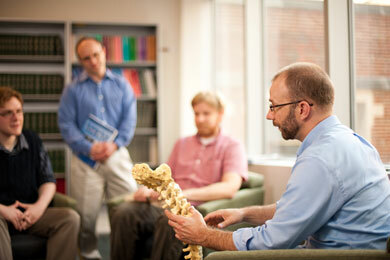 VUIIS is supported by grants from the NIH, NSF, DOD, DOE, industry and foundations, as well as Vanderbilt University. At VUIIS, providing an exemplary training environment for postdoctoral fellows, graduate and medical students, and undergraduates is central to our mission. We bring together a strong faculty of imaging scientists with diverse backgrounds and broad expertise in a comprehensive, integrated program dedicated to using imaging to improve health-care and for advancing knowledge in the biological sciences.